The 5100 Series First Response Systems meet the demanding needs of utilities, industrials, and contractors who require a highly portable, easy to use, complete fault location system. The First Response System makes use of innovative TDR techniques and compact HV components to provide the lightest, most portable system on the market. These systems will reduce your fault location time by 80% by allowing quick and easy sectionalizing of faulted loop feed URD installations and provide fast fault location in underground cables. The 5100 Series First Response Systems combine a cable fault locator, high voltage filter, digital high voltage TDR, and battery power into one complete, cost-effective package. Connection to the cable under test is easy with quick clamp connectors on an HV output cable. When using the First Response System, there is no need to disconnect transformers while fault locating. The system is quickly and easily powered-up to the fault location screen on the TDR. 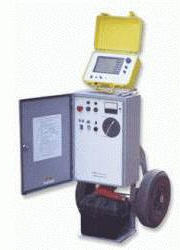 Once connected, a trained operator can find faults in a matter of minutes. The digital ARC reflection TDR allows built-in storage of up to 16 sets of three waveforms for comparison. In addition, the First Response TDR has a built-in serial port to allow an operator to download waveforms to a computer for evaluation or long-term storage.